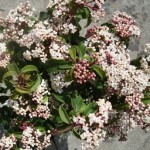 A dense shrub with dark green foliage and fragrant pinkish-white blooms. The flowers are followed by metallic blue berries in summer. It prefers a site in full sun or part shade, in an average, well-drained soil. It grows better with reliable summer moisture. 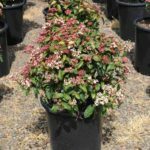 Use as a hedge, screen, or in a shrub border.